New Zealand broke the deadlock between themselves and the host Australian club for the greatest number of Harken International Youth Match Racing Championships won in the event's 26-year history, and successfully defended the strong sailing nation's 2017 title in a dramatic final race on Sunday November 25, 2018. Whittled down from the 12 teams which began their Harken International campaign four days earlier, Jordan Stevenson's Royal New Zealand Yacht Squadron team sailing five-up and James Hodgson's Cruising Yacht Club of Australia crew of four earned the right to a first-to-two sail-off on Pittwater in Sydney's north. A large spectator fleet and the minor-placed teams watched the duelling pair go into the decider one race apiece and the result be determined metres from the finish when the two Elliott 7s came in contact and Stevenson cleverly forced the winning penalty then crossed first, leaving the CYCA team to rue the loss and replay those final seconds in their heads over and over. "We needed to close the gauge up on the final downwind and we adjusted in time - we had them locked in and it felt good just sitting inside them," said the victorious skipper back at the host Royal Prince Alfred Yacht Club. His crew included Mitch Jackson, George Angus, Jake Erson and Celia Willison. On the all-sorts they faced this Harken, from winds 15-25 knot WNW on day one, a blown-out day two with blasts of 50 knots, lighter spring westerlies allowing a 10-hour catch-up day three and finally NW-SE 8-11 knots on day four, Stevenson added, "we just tried to be as consistent; that's all you can do, just adjust to what's coming.... especially today." "It was a super tough end, but that's sailing," Hodgson remarked of the frustrating final encounter and resulting second overall. Reflecting back on the closing day's events he commented "we didn't sail the conditions as well as we could have." Stevenson and Hodgson met in the semi-finals at the CYCA's Australian Open Match Racing Championship last month. That time Hodgson, the former Opti and 420 sailor from the Sunshine Coast, Queensland who has moved to Sydney to attend university, and his crew of Ryan Wilmot, Harry Hall and Charles Gundy had the last say. 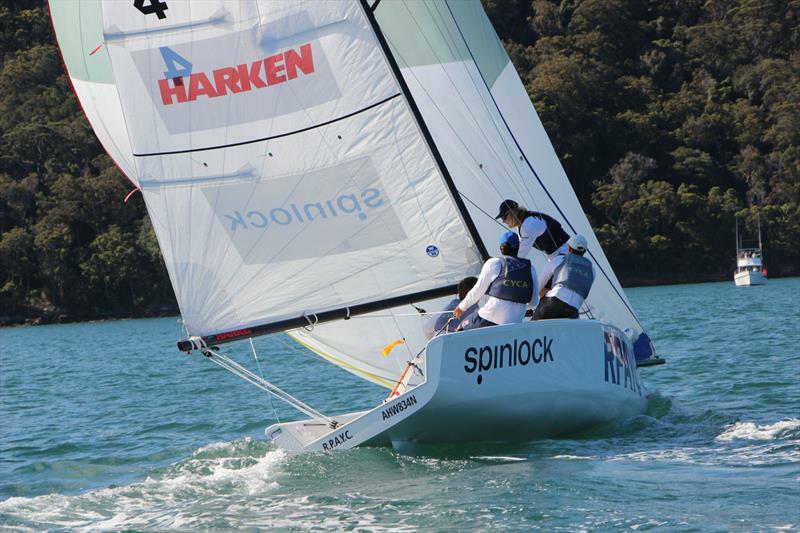 Third overall in the Harken International, a long-established youth regatta for teams aged 23 and under, was the second RNZYS team, skippered by Frankie Dair. Stevenson and his crew now return to Auckland having defended last year's win by Kiwi club mate Leonard Takahashi while Hodgson and a few other Harken teams shift their focus and belongings to the CYCA for the Musto International Youth Match Racing Championship which starts today, Monday November 26, and runs through to Friday November 30. Robyn Wiltshire, who donated the main Harken International Rockin'-Robin Trophy, and Harken Australia's managing director Grant Pellew were both on hand at the final prize giving, Pellew confirming another three years' support in addition to the company's 21-year association with the longstanding youth regatta. The RPAYC thanks Harken Australia, PRO Ted Anderson, the umpire team and all the volunteers plus club families who billeted visiting sailors representing Balboa Yacht Club in the USA, the Cercle Nautique Calédonien in Noumea, RNZYS and Royal Port Nicholson Yacht Clubs in New Zealand plus Darwin Sailing Club and the Newcastle Cruising Yacht Club for collectively staging another world-class Harken International Youth Match Racing Championship. The RNZYS now proudly holds the record for the greatest number of Harken International wins - eight - one more than the host club. Full results can be found here. © 2018 All rights reserved, Harken Inc.